I haven’t paid the Restaurant Ach’i a visit for about two years but the place still exists and they still offer decent dishes for a very fair price. 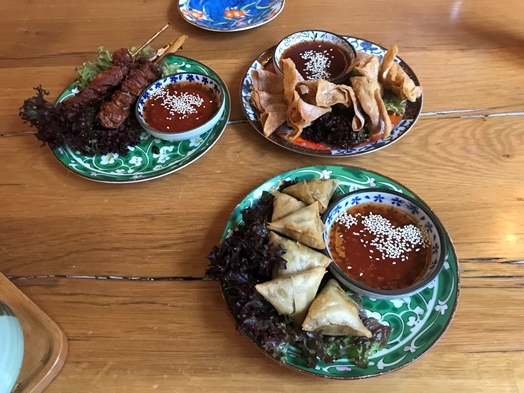 I went for the “deep fried curry dumplings” (CHF 5.00) as a starter (the one thing below in the picture) and they were actually quite good but a bit on the doughy side. 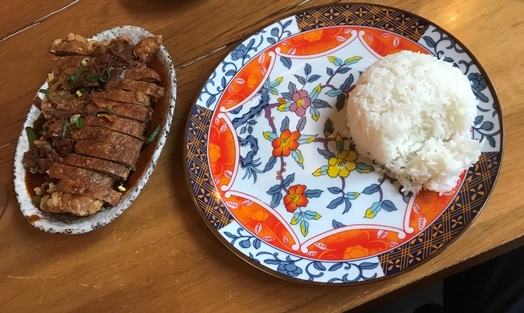 The “deep fried duck with sweet and spicy sauce” (CHF 24.00) was good as well – there was plenty of duck and enough rice to mix the two together in a pleasant way. The dish itself is good but far from excellent. The service is swift and friendly but you have to make sure you order by “number” (each dish has a number on the menu) as else you might get something you didn’t order. The prices are absolutely okay which is also true for the beverages with CHF 5.20 for a “fresh ginger tea with honey” or half a liter of water (CHF 4.20). Unless you go there right when it opens at 6pm, it might be super tricky to get a table. As about 80% of the tables were already booked when I arrived – and shortly after that, the place was full.